With multiple Scottsdale and regional titles to his credit, this handsome 2004 chestnut gelding is by Falcon BHF and out of the lovely Bey Shah daughter BHF Anna Tevkah. 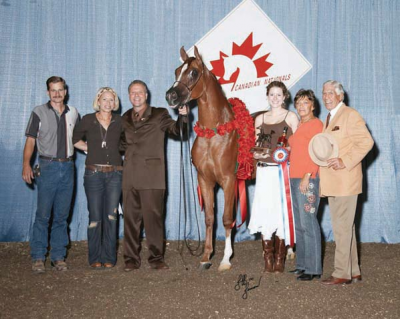 Firestorm BHF was the 2006 Canadian National Champion Arabian Two-Year-Old Jackpot Gelding and in 2007 he earned a Top Ten and Reserve Champion title at the Canadian Nationals and the U.S. National Arabian Futurity Gelding In-Hand Championship title out of a field of 19. He has since been a Top Ten at Youth Nationals and continues to be shown successfully on the regional and national level.